Wish your school would remember what teachers are supposed to be? Sick of the buzzword bandwagon? This is THE episode to share about how we need to reinvent teaching today. Josh Stumpenhorst will get you motivated to teach. We can get kids excited about learning! You can be a better teacher. Here’s how. What does a modern teacher look like? Josh exposes the shows why “teaching the way we were taught” kills learning. Why buzzwords get us off track. The one question about technology we must answer. If we can’t, get rid of it. How some teachers have been shamed into using technology (and slowing down learning). Kids are different today. Josh gives 2 forgotten motivators. If you want to get motivated about teaching and get past the buzzwords, this is it. 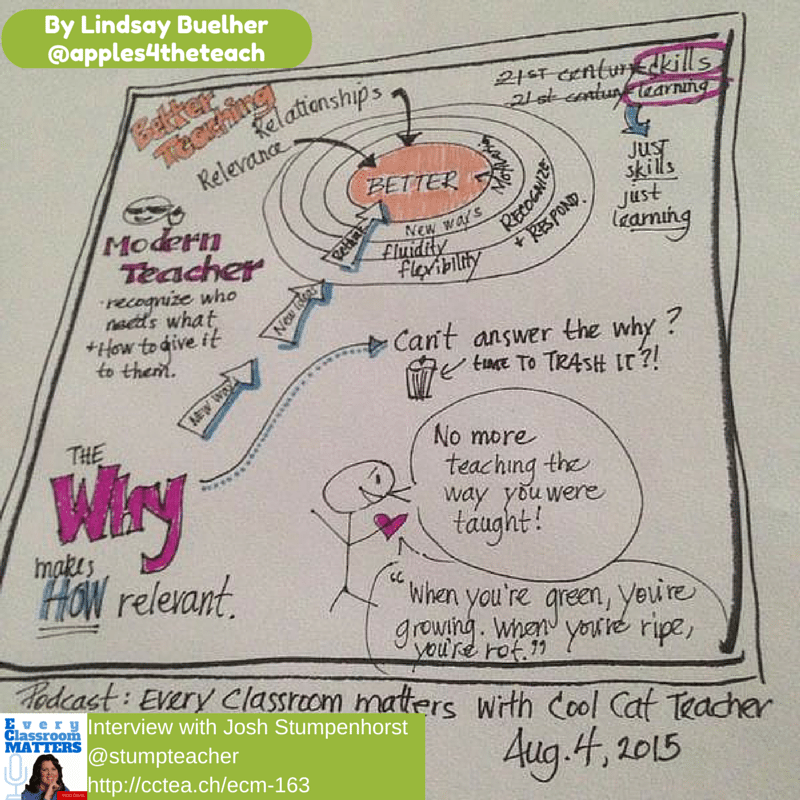 Scroll down for an awesome sketch note from listener Lyndsay Buehler. 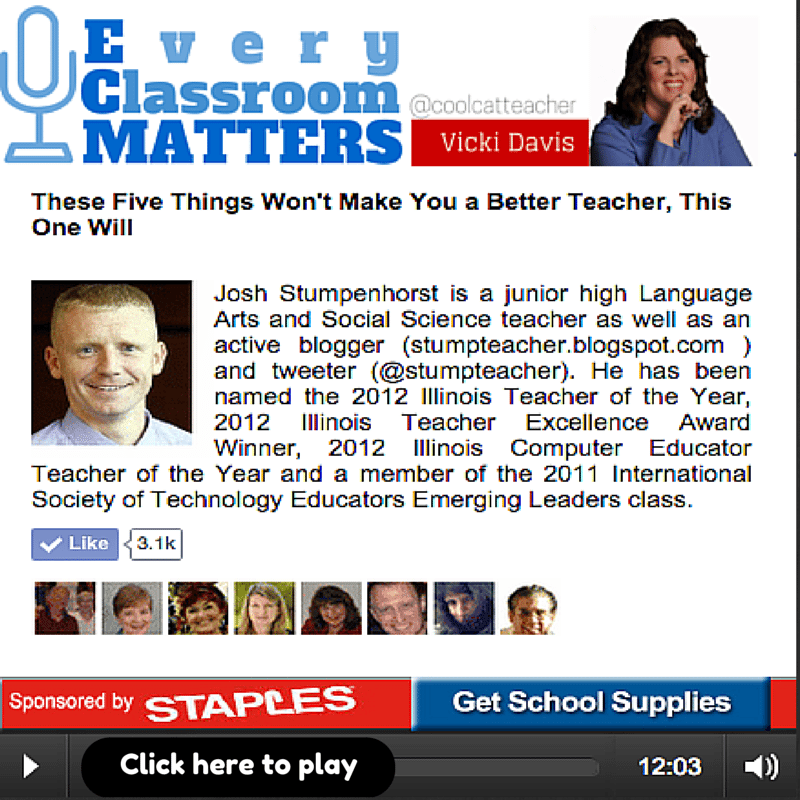 The New Teacher Revolution by Josh Stumpenhorst we discussed in the show. Staples. Staples has everything a teacher needs for Back to School. Remember to check out the Teacher Rewards Program. Join theTeacher Rewards program and check out my Top 10 School Suppliesto buy at Staples. Remember that the week of August 2 – 9, there is a massive Teacher Appreciation Event ! Excellent post. This is exactly how I feel about what I want to do in my classroom this year. I want to encourage student conversations; let students develop and take ownership of how they learn. It is truly about knowing my students, who they are, what they need (and don’t need – I’ll have to remember that sometimes I just need to get out of the way!) and the best ways to facilitate learning. Thanks, Josh! You’re invited! Join the Every Classroom Matters Awesome Educators Network on Facebook. The post These 5 Things Won’t Make You a Better Teacher, This One Will appeared first on Cool Cat Teacher Blog.